I have been at my new job 2 months in 2 days. Wow...funny how fast it was for me to fit right in. Said she never wore it and wanted me to have it. That was so sweet. 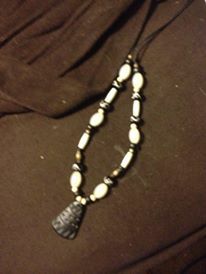 Then today I commented on Melissa's necklace and she said she don't know why she wore it cause she don't like anything on her neck. She took it off and gave it to me. Tried to give it back but she said she wanted me to have it. Isn't it pretty? Probably is going to be that I have it in my mind I have to match earrings to my necklaces.... gotta start looking for beads like this! I have had a lot of firsts in many years since going to work for the school. What I mean is that it has been many, many years since I bought a meal ticket! LOL bought one today. And this is my $2.00 salad today. when I had my pic made for the yr book! Moose my sis in law and brothers dog. Chilling in the fish pond! Climbing over the rocking chair! Not sure what this bush is but I LOVE it. Love this tree. Just so cool looking. View from my brothers deck. So relaxing. I have always loved hot air balloons. The Wizard of Oz and Clowns! Last weekend I went to Percy Warner Park for the Balloon Glow. I used to always attend the KOOL Balloon Races that Nashville used to hold but its been many, many years. That used to be an all day thing but the glow last week was the end of a festival. When I was a teen and I went to the KOOL races I helped with spreading the balloon out and filling it with cool air, then helping to set it up with the warm air. To help to fold it up and store it back in the basket. 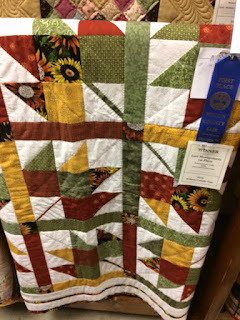 First place at the county fair. This is the quilt she made for my brother for Christmas.